As Washington debates carbon fee, one oil giant is opposed but another is silent; what’s that about? Shell, which operates the state’s second largest refinery, in Anacortes, has opted to sit on the sidelines of what has emerged as one of the most expensive initiative battles in Washington history. If approved, Initiative 1631 could serve as a model for other states. Podcast: What would Initiative 1631’s carbon fee do for clean energy, and for gasoline prices? For BP, this initiative is cause for alarm. The company has shoveled more than $6.3 million into the opposition campaign that so far has collected more than $20 million to denounce I-1631 as an unfair burden to consumers and small-business owners. “We cannot support I-1631 in its final form because it’s a poorly designed policy that would disrupt Washington’s economy without achieving significant reductions in carbon emissions,” wrote Bob Allendorfer, manager of BP’s Cherry Point refinery, the state’s largest, in an Aug. 3 letter to state Rep. Joe Fitzgibbon, D-Burien. These divergent political paths reflect the strains within an oil industry struggling to figure out how to respond to climate change in an era when runaway wildfires and record-shattering rainfalls bring home the risks of a warming world. Most oil companies have set aside decades of climate-change denial to acknowledge the risks that lie ahead from the atmospheric build up of emissions released by fossil fuels. These policy shifts come amid stepped-up pressures from some shareholders, consumers and a rash of lawsuits — including one from King County — alleging that major oil companies should pay billions of dollars in compensation. Washington has emerged as an important climate-change state in the oil industry because it has five refineries and is a kind of U.S. test kitchen for carbon pricing. Within the past decade, the Legislature repeatedly considered — and rejected — different recipes for cutting these emissions, and voters statewide in 2016 rejected a carbon tax. 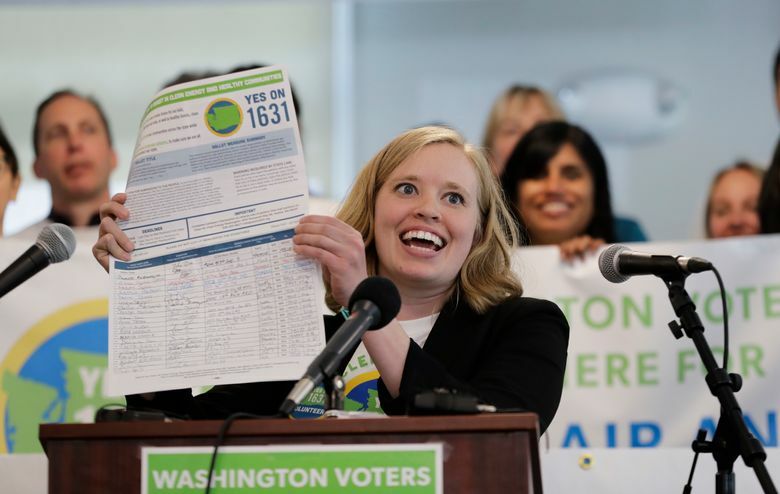 I-1631 offers a different approach: an escalating fee that would be assessed on most fossil-fuel emissions in Washington. The fee is projected to raise more than $1 billion by 2023, and the money would be invested in projects and programs to help reduce the state’s reliance on these fuels and adapt to climate change. The broad principles of carbon pricing have been repeatedly backed by the leaders of Shell and BP. They say such government regulation is key to reducing fossil-fuel consumption in the increasingly longshot effort to try to limit global warming to less than 3.6 degrees Fahrenheit — the target set by the 2015 Paris agreement that has gained the backing of nearly 200 nations. A Shell “Energy Transition” report this year called carbon pricing an “essential tool for reducing emissions,” and noted that investments in electric-vehicle charging networks and other technologies would reduce the company’s reliance on oil and gas production. And Shell appears to accept a French government move to ban the sale of gas- and diesel-powered cars by 2040. “It is certainly something that we recognize needs to happen to meet the goals of the Paris Agreement,” said David Hone, chief climate adviser for Shell who writes a corporate blog. BP also has rallied around the Paris agreement. BP officials say the company has long supported a cap-and-trade system that puts a price on carbon in Europe. It has backed legislation to renew the California cap-and-trade program, and it is a founding member of the Climate Leadership Council, which advocates a nationwide carbon tax in the U.S.
Other oil companies have not been so outspoken. They include Phillips 66, which operates a Washington state refinery. The company has emerged as the largest donor so far to the I-1631 opposition campaign, with contributions of more than $7.3 million. Phillips 66 acknowledges the risks of climate change in a Securities and Exchange Commission filing warning investors that rising sea levels “may disrupt our ability” to operate some transport facilities and refineries. In that filing, the company lists “climate change legislation” as a “risk factor” that could increase operating costs and reduce demand for its products. Some industry observers say the actions of BP and Shell sometimes do not reflect their green rhetoric. In Washington, the Western States Petroleum Association is the sponsor of the committee formed to defeat I-1631. 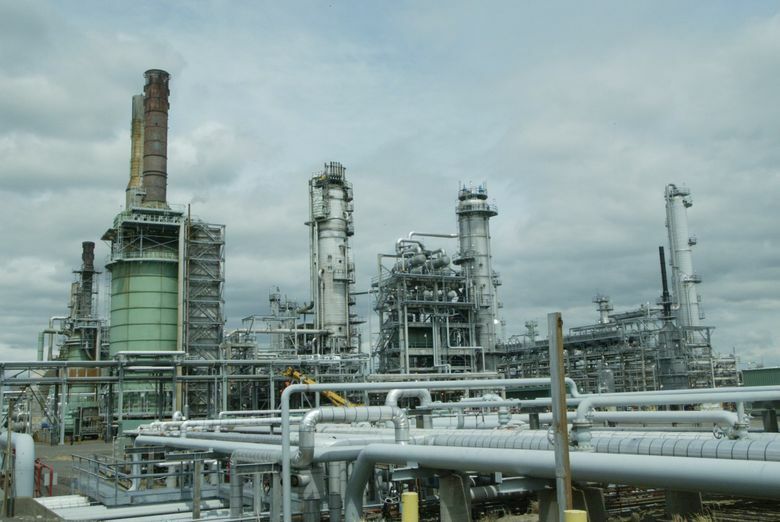 On April 25, the five companies that operate refineries in Washington — BP, Andeavor, Phillips 66, U.S. Oil & Refining Co. and a Royal Dutch Shell subsidiary — made initial pledges totaling several hundred thousand dollars to the committee. By July, Shell had decided to suspend participation in the opposition campaign. “Voters will decide what the best course is,” said Curtis Smith, a Shell spokesman. Shell’s willingness to break from the opposition was welcomed by backers of I-1631. BP officials reject the idea there are inconsistencies in their approach. They note BP worked closely with Carlyle this year in the failed Olympia effort to gain passage of a carbon tax — and would work with him again next year if voters reject the initiative. BP’s preference has been for a carbon fee (or tax) that is spread across all sectors of the Washington economy. Instead, during the last legislative session, lawmakers granted exemptions to some industries facing international competition. The initiative, unlike the failed legislation, does not offer oil companies the refinery exemption. But it does exempt some other significant sources of carbon pollution, including a coal-power plant scheduled to shut down in 2025 and an Alcoa smelter. BP officials say those exemptions undermine the goals of reducing emissions, a charge proponents reject. BP officials also fault the initiative for failing to prevent other state or local carbon regulations that could potentially pile on top of this one. Initiative proponents have a different take. “They claim to tell the world they are in favor of acting on climate change. But when they have the opportunity to live that value — they don’t,” said Vlad Gutman-Britten, Washington director of Climate Solutions and one of the drafters of the initiative.